One film genre that I have never cared for is giallo. I’ve watched four films by the master of the genre, Dario Argento: The Bird with the Crystal Plumage (1970), Deep Red (1975), Suspiria (1977) and Tenebre (1982) and I disliked all of them. I know this is blasphemy for fans of the genre – but we can’t all love everything, right? I’m not exactly a fan of the successor genre to giallo – slasher movies – either. The ones I have enjoyed I can count on one hand: The Texas Chain Saw Massacre (1974), Black Christmas (1974), The Hills Have Eyes (1977) and Halloween (1978); the latter being one of my favourite films of all time. I also adore Wrong Turn (2003) – which I have watched multiple times – but I’m not sure that it can be classed as a slasher movie. I also thoroughly enjoyed All the Boys Love Mandy Lane (2006). I didn’t care for Friday the 13th (1980) nor A Nightmare on Elm Street (1984) nor Scream (1996), and I thought I Know What You Did Last Summer (1997) was pathetic, but perhaps this has a lot to do with the diminished impact these films had on me watching them for the first time as a middle-aged man. I saw Halloween when I was 14 years old and it scared the bejesus out of me. But watching films such as Candyman (1992) have no impact on me except to annoy and bore me. Child’s Play (1988) I could never bring myself to watch, the idea is so ridiculous. But I admit I’m approaching this type of film with the wrong attitude. Maybe it’s just easier to say, That’s not my taste. My goodness, what a self-indulgent post this has become! As for remakes, I thoroughly enjoyed, The Texas Chainsaw Massacre (2003), House of Wax (2005) – although I haven’t seen the 1953 original – The Hills Have Eyes (2006) and The Last House on the Left (2009); but I abhorred Rob Zombie’s Halloween (2007). More recent originally-written slashers I have enjoyed include High Tension (2003), Inside (2007), Them (2006), and also its U.S. remake, The Strangers (2008). Also on the Enjoyed list are Creep (2004), The Descent (2005), and the superb Eden Lake (2008), although I am unsure whether any of those can be classed as proper slasher movies. Okay, I see that I can’t count the slasher movies that I like on one hand! There are quite a lot of them. I wonder why I like some but not others. Anyone out there have any ideas? 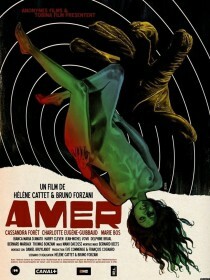 Recently I enjoyed an astoundingly original 90 minutes of my film-watching life with Amer (2009). This visually exquisite thriller does not follow the archetypal giallo – it is almost bereft of violence and horror, and the film was produced outside of Italy – yet it is still considered a member of the genre due to its use of stylistic and thematic giallo tropes. In some ways, watching Amer was difficult. Some slow-moving scenes, bereft of dialogue, took a marked effort of concentration and patience for me to get through. But the visual, aural and – to a lesser extend – narrative experience was highly original and immensely gratifying. This gratification took some time to assert itself. Images from different scenes kept popping into my head at random times for a week or more after viewing the film, leaving me marvelling at the impact of this richly-decorated production which had left its tapestry imprinted on my brain. Looking back on the experience, Amer spoke so much to me during its running time. With few words and a plethora of captivating images, this film shared with me the myriad of emotions experienced by its handful of players in what seems now like a very short time. As always, I recommend you don’t risk ruining any of the film directors’ planned impact by reading spoilers or watching trailers before watching the feature. But here it all is, if you simply cannot resist! You can find more information on this Belgian-French movie on Wikipedia, IMDb and Rotten Tomatoes. Child’s Play (1988) I could never bare to attempt to watch. Hi John. Many thanks for your thoughts. And thank you for opening up the pathway to your site. I love film noir and it is very interesting to see you have published a book on the genre. I was searching for an About page to read more background on you but I couldn’t find one. Did I miss it? I was very interested in your notes on Amer and made a note to lay hands on a copy sooner rather than later. There’s a brief bio of moi on the site’s main page under the embarrassingly whimsical geading “Perp’s Profile” — it’s in the sidebar on the right. Fascinating stuff, John. And I still can’t get over the internet and how I can find a photo of you and now visualise with whom I am chatting. Crazy times. I will buy Discarded Science for a friend of mine who I am sure will thoroughly enjoy your insights. By the way, I love the way you’ve labelled your site’s sidebar. Fun! This film was….quite the experience to say the least. I’ve just re-read my review of it and I appreciated the production values but not being a fan of the Gaillo genre meant I found it hard to follow. I didn’t hate it – I just didn’t get it. Hi Lee, hi Pete. Thanks for leaving your comments. Yes, I’ve also seen and thoroughly enjoyed Berbian Sound Studio. A very well put together and interesting film. I rate Eden Lake highly. It is horribly frightening because there are really are scum like that living in England. So it really got under my skin! That’s it exactly. If you have ever been a young (ish) person in the UK, you will relate to that film 100%.